This super coop is a life-saver if you have more than a few hens. It's big enough for you to easily step inside and clean the interior or tend your flock. And you won't have to worry about your hens feeling claustrophobic. Coop pictured here with Cleaner Coop trays and solar light package upgrade. For customers who love the look of our best-selling chicken coop but have more than 12-15 chickens, this is the chicken coop for you. Our Super Coop has all the same features and all the same specs as the Quaker coop. We just increased the size to accommodate larger flocks. Coop pictured here with metal roof and solar light package upgrade. Over 6' height clearance inside! Shown here with painted LP Smartside siding: Clay with Beige trim and Weather Gray shingles. Here we show our "Super Coop" chicken coop built with LP Smartside painted siding. Classic "Barn Red" with white trim and black shingles is a traditional favorite. However, we have many siding/trim and shingle color combinations to choose from if you've got something else in mind. You might prefer pine board & batten or tongue & groove siding for your coop. If so, we offer several choices of stain. Either way, the price is the same. In this example, we've taken the standard coop model and decked it out with some of our most popular chicken coop accessories and upgrades. ALL our backyard chicken coops come with everything you need to keep your hens safe and comfortable. There's nothing extra you need to buy. But, we're sure chicken lovers will agree - We all want the best for our "girls." So, let's take a closer look at some of the standard features and optional upgrades that make this backyard chicken coop extra special. 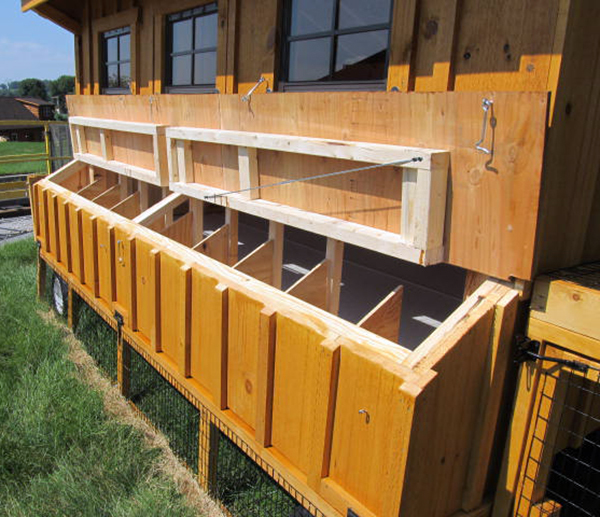 If you've done any kind of research of chicken coops, you'll know there are many opinions about how the "ideal" coop /roost bars /nest boxes, etc. should be set up. There seems to be no single consistent answer for any one thing. We've tried our best to incorporate the most common suggestions for sizes, materials and dimensions of the various coop elements into the design of our chicken coops. The inside of this coop is definitely "a room with a view" no matter where you set up it up. The 3 screened windows in the front let in so much light your chickens will be happily laying eggs practically all year round. Open the drop vent on the back wall and you'll think you'll need to wear sunglasses! Especially when you upgrade with a gleaming white Glasbord floor. Non-toxic and easy to clean this durable fiber-glass reinforced plastic flooring protects the 5/8" pressure-treated wood floor underneath AND adds even MORE of a deterrent to rodents who may try to chew through. Here you can see how the generous "drop vent" really lights up this coop! This open vent maximizes natural light and fresh air flow. The solid hinged panel closes tight with a simple twist of the wooden knob to keep the elements at bay on cold wet days and nights. Safety isn't sacrificed for bird well-being – the vinyl-coated mesh keeps larger predators out while the vent is open. This chicken coop comes with (12) 1'x1' nest boxes accessed from outside the coop by a split nest box lid. The split lid design is easier to open and close than a one-piece lid. And, because only half the nest boxes are exposed at one time, it's less likely chickens at the far end of the coop will be hopping out while you're gathering eggs on the other end. We've redesigned our nest box lid... Having the lid hinged in this way allows it to rest on the extended nest boxes while you gather eggs, change out the nesting material or check on your birds. No need to worry about it falling down on your hand or an unsuspecting hen! Opening both sides gives you access to the full 12' long row of nest boxes. You and a helper can quickly and efficiently collect the day's egg cache in a single pass without having to go inside the coop. In keeping with the Five Freedoms guidance that promotes proper animal welfare, experts recommend one nest box per 3-4 birds. Did you know: birds are less likely to soil a darker, private area? Tacking a piece of burlap over the front will create a very nice space especially for broody birds. The lip in front of the boxes will keep eggs from rolling out onto the floor and help to contain the bedding. Our 12"x12" size is roomy enough for most chicken breeds to feel comfortable nesting, standing and moving around inside the box. Our roost bars are natural pine 2x3's – no paint, stains or other chemical treatments added. There are 2 bars running the entire length of the coop (12'). The uppermost roost bar is approximately 10" from the back wall of the coop and about 38" from the floor. The lower bar is approximately18" front the back wall and 35" from the floor. Your chickens will have plenty of room to hop up, turn around and settle in comfortably for the night. The placement of the roost bars also gives the hens a comfortable vantage point to look out the front windows and keeps droppings away from the nest boxes. Over 60% of all the chicken coops we sold this year had the Cleaner Coop Cage option! The picture above shows how the Cleaner Coop trays fit nicely within the wire-enclosed Cleaner Coop Cage. The area directly under the roost bars is generally where most of your chicken's poop will accumulate. The wire cage keeps it contained for easy removal via the trays. Two hinged panels on the back of the coop open with a simple twist of the wooden latch to allow access to the Cleaner Coop trays. A handy latch holds the panel open allowing you to pull out the trays. Empty the droppings into your wheel barrow or carry the tray directly to your garden or compost pile for free, organic fertilizer. Another hugely popular upgrade is our electrical package. Nearly half of all coops sold had this option. 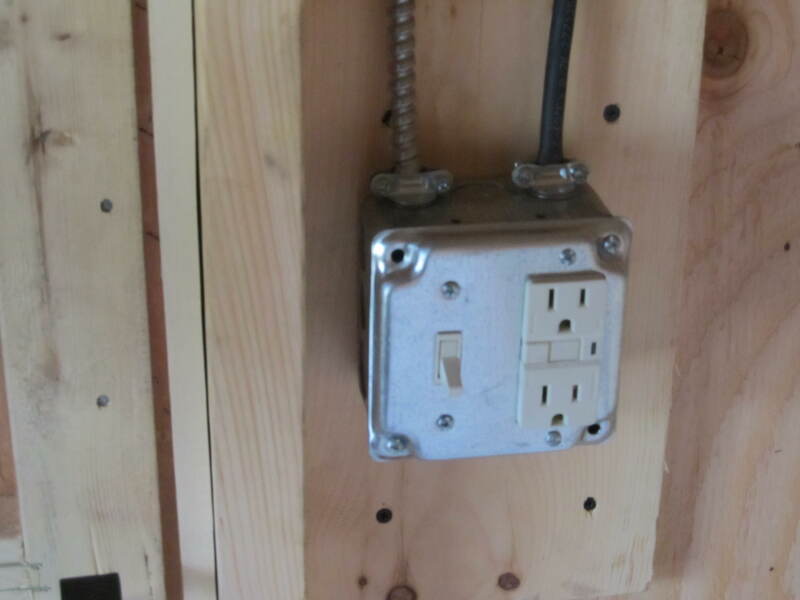 The electric package includes a light fixture, outlet and switch. ALL wiring is enclosed in metal conduit. Plug it into any outlet then connect it to the coop to bring power to your hen house. Once connected, the coop light is controlled by the switch. Use the outlets for a heat lamp or de-icer. 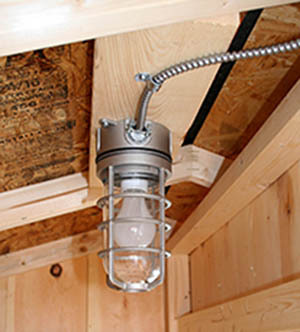 Another popular option to light up your coop is our solar light package. We mount the solar panel on the coop roof. The "heart" of the system is installed inside the coop in a neat little wooden box. A simple hook and eye latch keeps it safe from the chickens yet easily accessible for you. Add a timer if you wish! 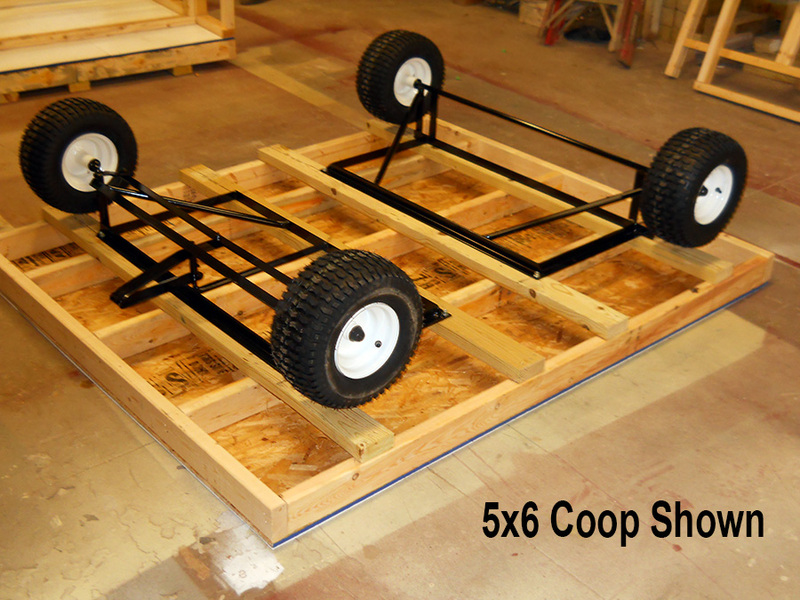 Another very popular option is the adding wheels to your coop. 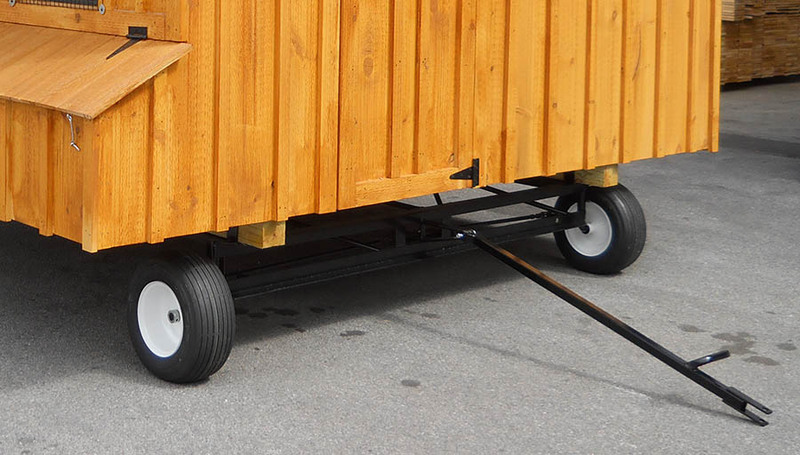 This allows you to move your coop from place to place to give your flock access to fresh grass and forage. Several of our customers have told us they've moved their entire coop into their barn or garage during extreme weather! Powder-coated metal wagon chassis includes handle and 4 pneumatic tires. Hitch it to your garden tractor, riding mower or ATV. Steer the front tires with the handle for easy maneuverability. Handle can be easily removed. Chicken Tractor wheel chassis shown on the Quaker coop. The tractor chassis takes the place of the fixed, pressure treated wood legs / base. In order to provide coast-to-coast delivery of our chicken coops and coop kits, we MAY require the services of a commercial carrier. This means that your coop MAY arrive via a large tractor trailer truck. Please call us at 888-447-4337 if you have concerns about the truck accessing your property. We will work with you to the best of our ability to make the delivery; however, your assistance may be needed in some instances.